Escape the urban bustle at Caldeira das Sete Cidades and Lagoa do Fogo. Take a break from Ponta Delgada with a short trip to Poca Da Dona Beija in Furnas, about 46 minutes away. There's lots more to do: get great views at Boca do Inferno Viewpoint, identify plant and animal life at Wildlife Areas, explore the activities along Furnas, and get a new perspective on things with Boat Tours & Water Sports. To find reviews, traveler tips, maps, and more tourist information, read our Ponta Delgada vacation planner . Montreal, Canada to Ponta Delgada is an approximately 9-hour flight. You can also do a combination of train and flight; or do a combination of bus, taxi, and flight. The time zone difference when traveling from Montreal to Ponta Delgada is 4 hours. Traveling from Montreal in September, plan for somewhat warmer nights in Ponta Delgada, with lows around 63°F. Wrap up your sightseeing on the 9th (Sun) to allow time to travel to Porto. We've included these beaches for you: Praia do Carneiro and Mindelo Beach. Step out of the city life by going to Praia dos Ingleses and Praia do Homem do Leme. Take a break from Porto with a short trip to Bom Jesus do Monte in Braga, about 48 minutes away. And it doesn't end there: snap pictures at Ponte de Dom Luis I, enjoy breathtaking views from Clerigos Tower, take in the architecture and atmosphere at Igreja da Ordem Terceira de São Francisco, and take in the waterfront activity at Cais da Ribeira. To see where to stay, more things to do, reviews, and tourist information, use the Porto road trip planning app . You can fly from Ponta Delgada to Porto in 5.5 hours. The time zone changes from Azores Time to Western European Time, which is usually a 1 hour difference. Traveling from Ponta Delgada in September, expect little chillier with lows of 56°F in Porto. Wrap up your sightseeing by early afternoon on the 13th (Thu) to allow time for the car ride to Albufeira. Visiting Falesia Beach and Praia dos Salgados will get you outdoors. Visit Praia Gale and Praia Sao Rafael for some beach relaxation. The adventure continues: kick back and relax at Praia dos Olhos de Água, identify plant and animal life at Wildlife Areas, stroll through Praia do Peneco, and wander the streets of Centro Historico de Albufeira. To see more things to do, ratings, photos, and more tourist information, you can read our Albufeira trip planner. Traveling by car from Porto to Albufeira takes 5.5 hours. Alternatively, you can take a train; or take a bus. Traveling from Porto in September, you can expect nighttime temperatures to be somewhat warmer in Albufeira, with lows of 65°F. Wrap up your sightseeing on the 16th (Sun) early enough to drive to Portimao. Escape the urban bustle at Praia Da Rocha and Praia de Alvor. 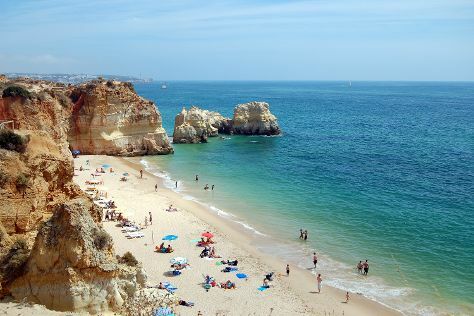 You'll get in some beach time at Praia marinha and Carvoeiro Beach. Step out of Portimao with an excursion to Odeceixe Beach in Aljezur--about 50 minutes away. There's lots more to do: enjoy the sand and surf at Praia de Benagil, explore the ancient world of Castelo de Silves, and tour the pleasant surroundings at Pescadores Beach. For more things to do, traveler tips, photos, and tourist information, you can read our Portimao travel itinerary planner. Portimao is very close to Albufeira. In September in Portimao, expect temperatures between 79°F during the day and 65°F at night. Finish your sightseeing early on the 19th (Wed) to allow enough time to drive to Faro. On the 20th (Thu), see majestic marine mammals with a dolphin and whale watching tour and then cruise along Precious Time. Keep things going the next day: kick back and relax at Praia do Barril, take in panoramic vistas at Camera Obscura, explore the historical opulence of Castelo de Tavira, then take in the architecture and atmosphere at Church of Sao Lourenco de Almancil, and finally pause for some serene contemplation at Faro Cathedral. To find maps, traveler tips, photos, and tourist information, you can read our Faro journey app . You can drive from Portimao to Faro in an hour. Alternatively, you can take a bus; or take a train. Expect a daytime high around 79°F in September, and nighttime lows around 65°F. Wrap up your sightseeing by early afternoon on the 22nd (Sat) to allow enough time to drive to Lagos. Start off your visit on the 22nd (Sat): enjoy the sand and surf at Praia da Luz. Get ready for a full day of sightseeing on the 23rd (Sun): kick back and relax at Praia Da Amoreira and then kick back and relax at Arrifana Beach. For traveler tips, where to stay, and more tourist information, use the Lagos tour planner. Getting from Faro to Lagos by car takes about an hour. Other options: take a train; or take a bus. Expect a daytime high around 79°F in September, and nighttime lows around 65°F. Cap off your sightseeing on the 24th (Mon) early enough to go by car to Lisbon. On the 25th (Tue), get to know the fascinating history of Belém Tower, then take a memorable tour with Lisbon by Boat, and then enjoy the sand and surf at Praia da ursa. Here are some ideas for day two: step into the grandiose world of Castelo de S. Jorge, take a stroll through Alfama, and then choose your vessel at Nosso Tejo. To see ratings, traveler tips, reviews, and tourist information, you can read our Lisbon trip itinerary builder site . Traveling by car from Lagos to Lisbon takes 3 hours. Alternatively, you can take a bus; or take a train. September in Lisbon sees daily highs of 81°F and lows of 61°F at night. Wrap up your sightseeing by early afternoon on the 27th (Thu) to allow enough time to travel back home.